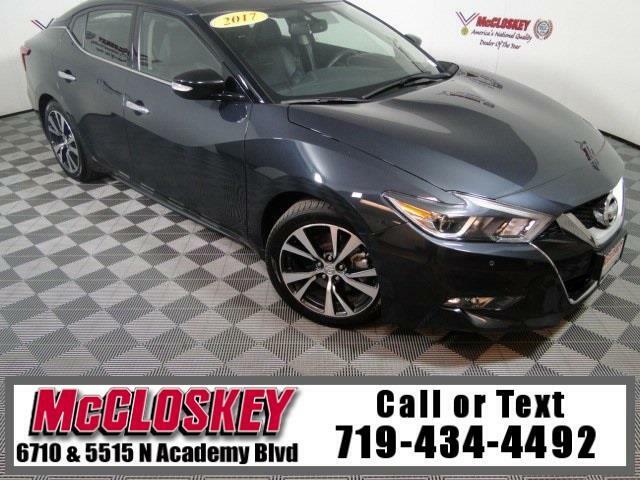 Pamper yourself in this 2017 Nissan Maxima 3.5L SL with Navigation System, Panoramic Moon Roof, Remote Start, Keyless Entry and Ignition, and Blind Spot Monitor! The SL model gets a panoramic sunroof, a heated steering wheel, ambient interior lighting, active noise cancellation, active engine sound enhancement, a premium 11-speaker Bose audio system and adaptive cruise control. Nissan has long suggested that the Maxima is a "four-door sports car." In our experience, the 2017 Maxima does feel rather sporty, with nicely controlled body motions and commendable grip around turns that equate to dynamic talents greater than the typical mid- or full-size sedan.